Point Pleasant sophomore Adam Veroski (7) battles a Williamstown player for possession of a loose ball during the second half of Thursday night’s Class AA-A Region IV, Section 1 final at the Shawnee Sports Complex in Dunbar, W.Va.
Point Pleasant sophomore Braxton Watkins-Lovejoy (00) breaks away from a Williamstown defender during the second half of Thursday night’s Class AA-A Region IV, Section 1 final at the Shawnee Sports Complex in Dunbar, W.Va.
DUNBAR, W.Va. — All good things must come to an end. 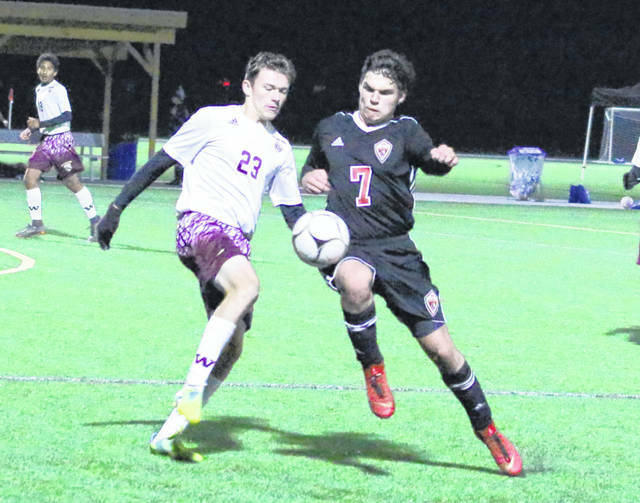 The Point Pleasant boys soccer team had its magical 2018 campaign come to a screeching halt on Thursday following a 3-1 setback to Williamstown in the Class AA-A Region IV, Section 1 championship match held on Brickstreet Field #1 at the Shawnee Sports Complex in Kanawha County. 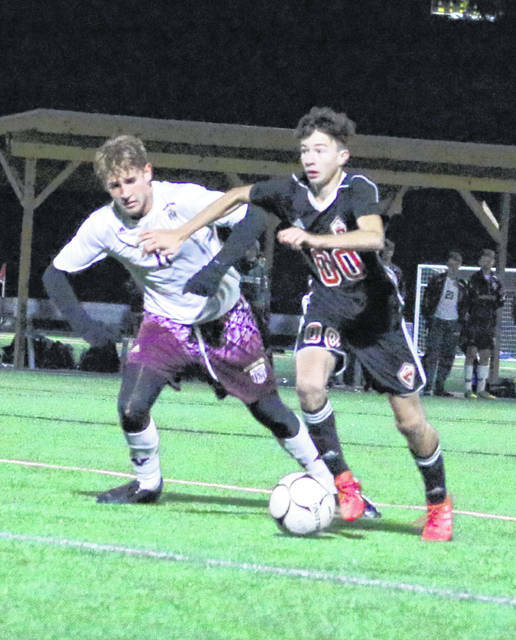 The top-seeded Black Knights (17-3-0) were gunning for their first sectional title since the 2011 campaign, but the Yellowjackets (15-6-2) unleashed an offensive onslaught that eventually took its toll by night’s end. WHS produced a sizable 32-10 advantage in total shots, which included a 15-8 edge in shots on goal. More importantly, that differential was noticeable from the start as the guests held leads of 17-5 and 7-3 in those same categories at the intermission. Still, despite the large discrepancy in offensive attempts, the Red and Black found themselves in good shape at the break as both teams entered halftime scoreless. 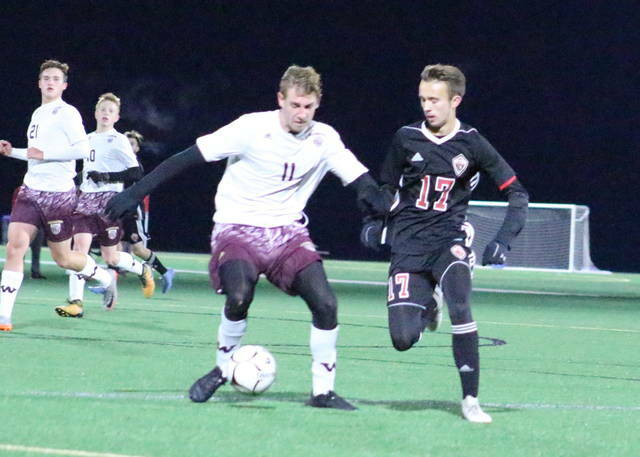 The score remained deadlocked at zero for another 10 minutes in the second half, but the Maroon and Gold — and their rapid-fire approach — finally caught up with Point Pleasant in the 51st minute. Dylan Cosner had a pass land on his foot inside 15 feet of the goal, then split a pair of Point defenders to uncork a shot from the right corner of the goal box. The attempt caromed off of Point keeper Nick Smith’s hands and momentum carried the deflection into the back of the net — giving WHS a 1-0 advantage. Four minutes later, Gavin Bosgraf successfully lofted a left-footed shot from the left corner of the keeper box to the lower right corner of the goal — allowing Williamstown to secure a 2-0 lead in the 55th minute. 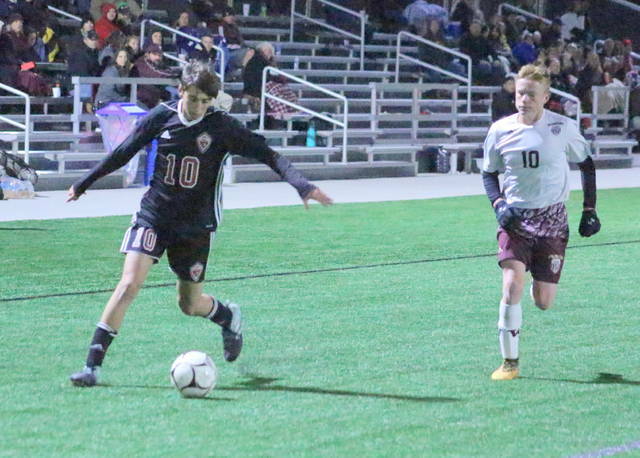 The Yellowjackets added the proverbial nail in the coffin in the 70th minute as Boston Caruthers netted a penalty kick into the lower left corner, just beyond the outstretched arms of Smith while giving the guests a three-goal lead. The Black Knights did, however, get rewarded for their persistence as Braxton Watkins-Lovejoy had a rebound land on his foot, then the sophomore buried a shot into the back of the net on the low left side with 5.4 seconds left in regulation — wrapping up the 3-1 outcome. Williamstown held a 23-6 shot advantage at the time of its first goal, which included a 10-3 edge on goal. In discussing the events of the night afterwards, PPHS third-year coach Chip Wood noted that he would have tried some different tactics if the game was to be played again. But, as he noted, Thursday night in no way took away from what the Black Knights had accomplished this year. In fact, it may only make them better moving forward. “Williamstown has some good athletes over there and they have a ton of seniors. They have a lot of experience and they play at a high rate of speed, and we’ve not had to play at that rate of speed all season,” Wood said. “I really felt that we could build more of an attack against those guys than we did, but this one is on me because we could have relieved more of the pressure they were putting on us. If we would have cleared and built from the middle of the field instead of working from the back, it may have been totally different for our kids. Williamstown claimed a 7-4 edge in corner kicks and was also whistled for 11 of the 20 fouls in the contest — including two of the three yellow cards issued in the match. Smith made a dozen stops in net for the Black Knights, while Baylor Haught stopped six shots in goal for the Yellowjackets. 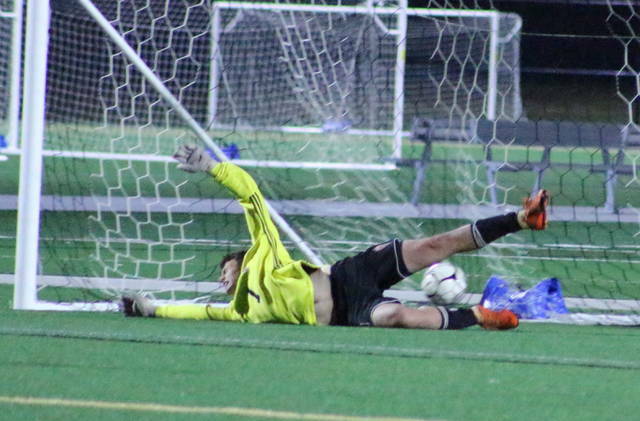 Grant Bobbitt also made one sliding save for WHS on an Adam Veroski shot attempt early in the first half.